This continuing education course covers signs and common symptoms of Parkinson’s disease, physical impairments associated with the disease, and potential symptom aggravators. Professionals will learn to create specific exercise management strategies and design programs for clients with this disorder. The second most common neurodegenerative disease of the elderly, Parkinson’s disease affects about 1 million people in the United States and 7 to 10 million people worldwide. Exercise and Parkinson's Disease CE Course, Second Edition, discusses signs and common symptoms of Parkinson’s disease, associated physical impairments, and factors that may aggravate symptoms. You will discover appropriate health-screening methods and exercise-monitoring techniques for your clients, and you will learn specific exercise management strategies and program design considerations. Provide a general overview of the clinical condition of Parkinson’s disease (PD). Identify the cardinal signs of PD. Identify motor and nonmotor symptoms of PD. List the direct and indirect impairments of PD and factors that may aggravate symptoms. Outline management strategies for PD. Discuss the benefits of regular physical activity in the management of PD. Explain the essential components of an exercise program for a client with PD. Discuss exercise design for clients with PD regarding mode, intensity, duration, frequency, and progression of exercise. Outline general exercise considerations and recommendations for clients with PD. Explain appropriate health-screening methods and exercise-monitoring techniques for clients with PD. Identify common classifications of drugs used in the treatment of PD and the drugs’ effects on the exercising client. Outline professional responsibilities of the exercise professional when working with a client with PD. Outline community and Internet resources for the client with PD. List evaluation tools that may be used to assess physical performances in the client with PD and to monitor the progression of the disease. A continuing education course for personal trainers and fitness instructors working with clients diagnosed with Parkinson's disease. Carol Ewing Garber, PhD, FACSM, FAHA, is a professor of movement sciences and director of the graduate program in applied physiology at Teachers College, Columbia University. She is the former president of the American College of Sports Medicine and is the author of more than 70 scientific articles and book chapters, for which she has received numerous awards. A clinical exercise physiologist, Garber’s clinical practice and research fall under the broad umbrella of the role of physical activity and exercise in the prevention and treatment of chronic diseases, including cardiovascular diseases and Parkinson’s disease. Prior to coming to Columbia University, Garber was on the faculty in the Bouvé College of Health Sciences at Northeastern University in Boston, Massachusetts, where she directed the graduate program in clinical exercise physiology. "I will definitely use the information to provide comprehensive and safe programs for my clients at every stage of Parkinson's disease. 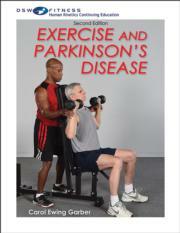 I especially liked all the facts presented to educate clients on the importance of exercise in managing the disease." "I have been training a man with Parkinson's disease for four months, and this course answered all my questions and far exceeded my expectations. I appreciate knowing what I am qualified to do and when I should refer to another professional." "After taking this course, I have an understanding of what causes Parkinson's disease and how exercise plays a role in maintaining certain aspects of the individual's fitness level. I learned the best way to teach balance exercises that translate to activities of daily living (ADLs) and how to explain the correct intensity for cardiovascular and strength training exercises for someone with Parkinson's."